This year will mark the 240th anniversary of the most famous river crossing in American history. At sunset, on a snowy Christmas night in 1776, George Washington assembled his cold, hungry, dwindling and dispirited army on the Pennsylvania side of the Delaware River about nine miles above Trenton, New Jersey. For the next ten hours, watercraft ferried across that fast-flowing, ice-choked river 2,400 men, 90 horses and 18 pieces of artillery. By 4 a.m., Washington was leading them through a blizzard toward Trenton, and by noon this ragtag fighting force had won its first victory and had changed the course of the war. 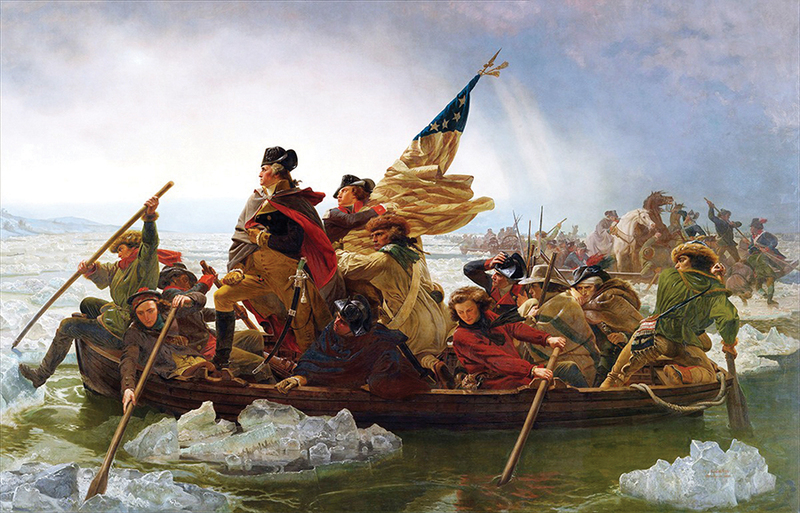 The well-known painting Washington Crossing the Delaware (1851) by Emanuel Leutze, contains several inaccuracies. “Seldom has so much been done with such slender means,” wrote historian John Fiske. Seventy-five years later, in 1851, a German painter named Emanuel Leutze gave us his colossal 12-by-20-foot version of Washington’s trip across the river, and it’s probably safe to say that this dramatic masterpiece has defined the event for most Americans. Never mind that nearly everything in the Leutze painting is wrong: the boats, the flag, the uniforms, the light, the ice; even the river is more Rhine than Delaware. Additionally, Washington and the flag-bearing James Monroe are too old. But hey, a painter (in Dusseldorf, no less) is entitled to take artistic license. Why? Because there’s so little evidence detailing exactly how Washington moved his fighting force, the horses and 400 tons of heavy equipment from one side of the river to the other. That meant Washington had to have included in his battle plan another means of transport. And somewhere there had to be a letter spelling out the specifics. For more than 100 years scholars burrowed into the archives but came up empty. Then, on January 12, 1880, a Bucks County, Pennsylvania, historian named William W. H. Davis revealed to the Historical Society of Pennsylvania that while sifting through a local private collection he had found the tell-tale letter. Though Davis had misread the date on the letter (it was December 19, not December 10), he told his audience that it was now certain that prior to the crossing Washington had ordered General Nathanael Greene to have at the ready sixteen Durhams and four flats—50-foot-long rafts (or ferries) with low sides and hinged ramps fore and aft. Onto these ferries horses could walk and cannon and ammunition wagons could be rolled. The ferries had the advantage of being tethered to a thick hemp rope that either ran above the river or was embedded in rock cribs below the surface of the water. Such tethering meant that however rough the current or however jarring the blocks of ice, the ferries would make a direct traverse from one landing to another. The long-missing letter was quoted again in an 1892 book, but being in private hands, it remained unavailable to most researchers and was soon forgotten. In 1916, Harper sold the letter to lawyer and book collector Alfred Chapin, who later donated it to Williams College, his alma mater. Though the archivists at Williams made no secret of having the letter, and though it’s listed in their 1939 catalogue under the title “the order for the boats to cross the Delaware,” most historians remained unaware of its existence. Then, in July 1984, Connoisseur magazine did a piece on Williams College, and published a picture of the letter. But few scholars read Connoisseur, and the article created nary a ripple in academic circles. Six years later, says Professor Widmer, a history buff spotted that July issue in a recycling pile and riffled through it. Intrigued by the contents of the Greene letter, he took the article to Harry Kels Swan, an historian at the Washington Crossing State Park in New Jersey. Swan was also intrigued, and he took the magazine to the editors of the Nathanael Greene papers, who after seeing the document, pronounced it “an unknown letter.” They tracked down the original at Williams College and confirmed its authenticity. Since then historians have finally caught up with this 240-year-old story. Both David Hackett-Fischer (2005) and Ron Chernow (2010) include the ferries in their chapters on the crossing. In 2013, William Welsch wrote that Washington may have utilized five ferries: the four that he ordered and the one already parked outside McConkey’s Tavern where the troops crossed. Presumably we’ll read no more accounts of men lugging cannon and urging horses into Durham boats. The surfacing of the elusive Greene letter has given us a more accurate version of the crossing and a better understanding of how a crafty and courageous commander pulled off a feat few thought possible.